Update: Beginning Monday, July 23 and through the duration of the Eads Street construction, two slug stations, 610 Mine Road and 610 Stafford, were temporarily relocated to North Rotary Road to alleviate traffic congestion along Eads Street, South Rotary Road and Fern Street. Update: New DC line emerging at the Route 610 Lot! The expanded commuter lot has created interest in starting a new line at 610. Description: Due to the HOT lanes, slugging has increased and now begins around 4:30 a.m. and is generally full by around 6:15. There are currently two lines: one for DC "downtown" destinations and another for the Pentagon/Crystal City. For the return trip in the afternoon from the Pentagon, look for the sign "610- Mine Rd". You can park at the Quality Inn and Suites (formerly Holiday Inn), which is adjacent to the Mine Road lot, for $5 a day or $60 a month. From what I have been told, they even throw in coffee! 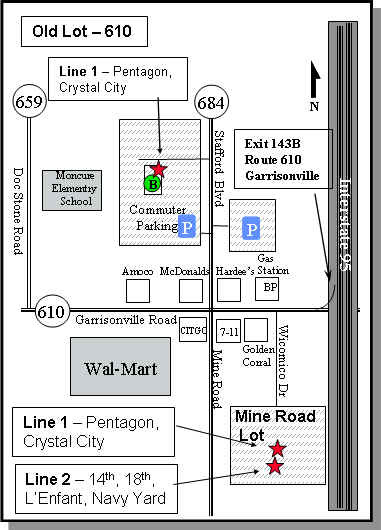 Drivers looking for Pentagon or Crystal City riders should try the 610 Stafford lot (behind McDonalds). Getting to the Mine Road Lot - you can reach the Mine Road lot either from Mine Road or if you are coming from 610 East, turn right (south) at the Marketplace light. To reach the New lot in the evening from 95 south, get off at the 610 west exit, but veer left at the split. Then turn left at the Marketplace light and stay in your middle lane to go to the lot. Drop-off and pickup are on the east side of the concrete "island" in the lot. It is one line for everyone (we haven't split up into the DC and VA lines yet, although there is talk of doing that). Best Hours: 4:30 - 8:00 a.m.—Good. Note - Some slugs park at the Garrisonville lot and take the Fred bus or park at the hotel. Drivers: In the early morning hours, if your vehicle has the capacity and slugs are waiting, please pick up three (3) slugs. Parking: Commuter lot. The Garrisonville park-and-ride lot is located on Staffordborough Boulevard just off Garrisonville Road (Rt. 610) about ½ mile west of I-95. Returning PM Slug Lines: Pentagon, 14th & NY, Rosslyn, L'Enfant Plaza, Crystal Gateway, 14th and G Street.